Visit My New Etsy Store "teaprint"
Hi Guys…. So from my last post you heard how I never really experienced my natural hair and I really didn’t go through a transition. I simply cut it all of. But when I did that I was ready mind and body to deal with how I would look. As I mentioned I looked at soooooo many Pinterest sites, of pics of women with short natural hair cuts that I was already excited and in love with the look. So that weekend, armed with my photo of how I wanted my hair to look, I organized with my father’s barber and set off to get my hair cut.. I arrived and waited a few minutes then It was my turn for the chair. I showed him the look I wanted and he seemed fine with it. I have to admit that when he started cutting I got a little nervous but when he was finished I was a little disappointed. I found it looked like a short afro but I knew that I still needed to go home and wash my hair so that my natural curls could come forth. That was the turning point. At home after washing my hair the beauty of my it came out. I looked adorable…if I say so myself…in fact I got so many complements that week, I knew for sure I had made the right decision. So now what? I enjoyed my low cut, I looked really good, but my goal was to see how long I could grow my hair . That was my goal and it would be quite a journey. 1. Remain with the short hair forever. Especially as it's the easiest hairstyle to deal with. No combing, no setting, no effort, no stress, nothing to do. You can go to sleep and get up without having to do anything. 2. Grow your hair as long as you can get it. 3. Choose a mid length hair length that you feel comfortable with. But this post is mainly about the after care. Luckily, with your hair that short all you need to do is maintain your hair care and stick to a good hair care routine. You can vary the routine at times for a change. Even try different products if you’re bored with the products you’re using. But always treat your hair well and make sure your hair is happy. The routine I used will grow your hair but you can either continue to cut it, trim it, or let it grow. What is that routine? With all the research I did I developed my own routine based on all the information I had gathered. 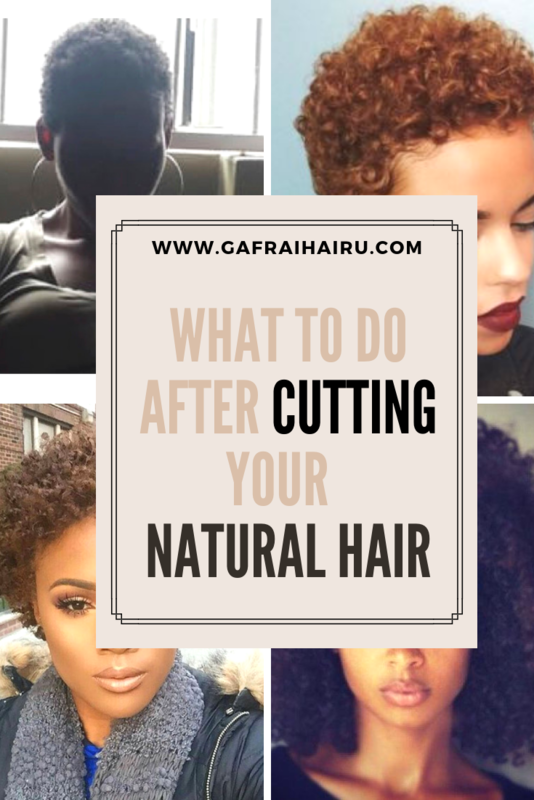 to start, You need to know what products your hair likes, what oils work in your hair, you need to decide on a natural hair care process/routine/method, and you need to know what is your hair goal. 1. Ensuring that my hair was always well moisturized. 2. Ensuring that I used the products that worked best for my hair. 4. Always being very protective of my hair. 2. A Styling Cream and finally rubbing in..
1. Co–wash my hair then wrap my hair in a T-shirt (don’t use cotton or normal towels as they dry out your natural hair). Co-washing is washing your hair with conditioner only. Conditioners hold some shampoo ingredients so they do clean your hair but without stripping away the oils within the hair follicles. You can do the entire process of shampooing and conditioning if you feel your hair is dirty but it isn’t necessary. I co-wash my hair three times a week maybe more depending on if my hair feels grimy. 2. Use the Jersy to soak up most of the moisture. I wrap it while I do other things then rub my hair fairly vigorously to remove most of the water from my hair. 3. Place a coin-sized amount of leave in conditioner in your palm and rub all through your hair. 4. Do the same with your styling cream then do the same with your oil. Ensure it is rubbed all through your hair especially on the ends. 5. Leave your hair in a wash and go style or do a twist. Don’t ever comb out your hair with a small tooth comb. This pulls the hair and makes it more difficult to handle. Finger comb your hair, open up sections with your fingers. 6. Do the process above when you’ve returned home from work. Then I normally sit and twist my hair, either in corn-rows, individually or in rows from a center part. 1. Wash my hair with Shampoos and Conditioners that contain sulphates. 2. Wipe my hair with a towel. 3. Let my hair dry before twisting. For me the twist comes out wavier when its done while my hair is still damp. Ensure that you aren’t doing this process too late in the evening, so that you don’t go to bed with your hair damp. Use a dryer on mid heat so your hair is fairly dry if you need to go to bed. 4. Comb my hair with a comb. I only use a huge tooth comb when I’m co-washing, to remove tangles. Other than that I finger comb my hair only. 5. Sleep on a silk pillowcase (you can get this on amazon here) or with a silk cap. This prevents the hair from drying out. Cotton or polyester bedding will dry out your hair. I mixed my own hair oils based on all the information I had gathered. In using certain oils individually I saw the effects of each oil on my hair. I tried using hair rods but ugh!! I can’t sleep with them in my hair as they give me a major headache the next day, so no curlers or rods for me. Because of that, I had to find another way to get the curly style and twisting was and is the best method for me. I also tried plaiting my hair in corn-rows. That came out ok but when I tried to loosen the plaits the ends got knotted and the waves are not as nice. Another style method is doing individual twists (not in corn rows) then wrapping them into a bantu knot. The next morning you have a nice thick wave with a curl at the end. It gives you an almost sixties hairstyle. A very nice look. I will share on the specific products I used in my next blog so look out for that. IF YOU LIKED THIS YOU MIGHT LIKE….. Please continue to read my blogs and send me your comments and feedback. I really want to hear from you.